Let’s begin our celebration of AMG’s 50th anniversary with a look at the first decade of their touring car racing exploits. We’ll cover the Affalterbach firm’s five decades of achievements over the next few months. In the beginning the focus was on motor racing and partners Hans Werner Aufrecht and Erhard Melcher chose some unlikely candidates to campaign on world’s great circuits. 1971: On 25 July a Mercedes-Benz 300 SEL 6.8, extensively modified by AMG, took everyone by complete surprise in the 24-hour race in Belgium’s Spa-Francorchamps to take second place in the overall placings. The experienced drivers Hans Heyer and Clemens Schickentanz took turns at the wheel of the 315 kW/428 hp racing saloon. With this coup AMG found fame overnight in the car scene. Even the German news programme “Tagesschau” reported on the surprise success. The legend was born. 1972: In March the 300 SEL 6.8 AMG, now repainted yellow, took part in the pre-tests for the 24-hour Le Mans race, but did not enter the race in June. But it was used in competitions, in the 24-hour race at Nürburgring at the end of June and in the Nuremberg 200 Miles on 6 August 1972 at Norisring. This was where Hans Heyer drove to victory in the “series and special touring cars over 2000 cubic centimetres displacement” class and ended the racing career of the 6.8 once again painted red. Later the car was sold to the French conglomerate Matra and converted for high-speed tests of aircraft tyres. 1980: Clemens Schickentanz and Jörg Denzel in the 276 kW/375 hp Mercedes-Benz 450 SLC AMG won the Touring Car Grand Prix on the North Loop at Nürburgring. After a two-year development period the sensational coupé with the infernal sound had thus fulfilled its remit not only to acquire technical know-how for the road-going vehicles but also to drive home victories with advertising appeal. 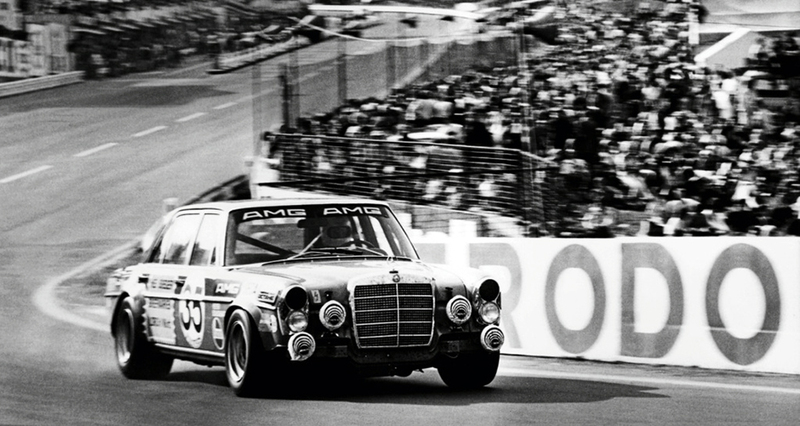 The AMG 300 SEL 6.8 at the 24-hour race in Spa-Francorchamps, 1971. And the Spa 300SEL 6.8 re-creation today. The 450 SLC AMG won the Touring Car Race on the Nürburgring’s Nordschleife in 1980. 1986: With a Mercedes-Benz 190 E 2.3-16, prepared by AMG, from the private racing team Dr Helmut Marko, Volker Weidler won the Eifel Race and the Avus Race as part of the emergent DTM. Driver Volker Weidler also took the DTM Vice Championship. Further podium places consolidated the reputation of AMG as a manufacturer of reliable and winning racing technology. 1987: On its own initiative AMG developed a DTM racing version of the 500 SEC according to the Group A regulations and constructed a racing car over the winter of 1987/88. But due to the lack of homologation, the huge V8 beast disappeared into the garage for the time being. 1988: Mercedes-Benz and AMG began their official partnership in motorsport. Right from the word go the team work was a great success: with the rebuilt Mercedes-AMG 190 E 2.3-16 Johnny Cecotto and Danny Snobek clocked up six wins. Plus there were a few second places from Roland Asch and Alain Cudini. 1989: AMG was the most successful DTM team with the enhanced 190 E 2.5-16 Evolution I. Klaus Ludwig and Kurt Thiim tucked seven victories under their belts. Klaus Ludwig eases the 190E 2.5 Evo 1 into Nurburgring’s ‘carrousel’ in 1989. 1989: In the 24-hour races on the Nürburgring and in Spa-Francorchamps AMG entered with the 500 SEC. The 5.0-litre eight-cylinder engine in the large Mercedes coupé developed 338 kW (460 hp) after a fundamental rework. A five-speed manual transmission replaced the standard four-stage automatic one. In order to comply with the rules the luxury coupé had to come down in weight from 1660 to 1340 kilograms. 1990: The more powerful 190 E 2.5-16 Evolution II, which had undergone a fundamental aerodynamic revision, celebrated its première. The high rear spoiler and the broad side flaps showed superb fine-tuning in the wind tunnel. The 502 units built for homologation soon became coveted collectibles. 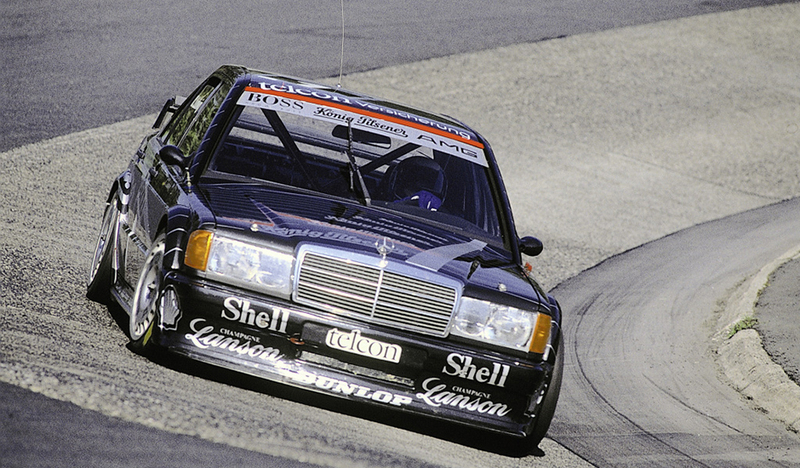 With four victories from Kurt Thiim and Klaus Ludwig AMG entered the DTM’s success statistics. 1991: Klaus Ludwig and Kurt Thiim clocked up six wins with the “Evo II”, four of which alone in the races at the Nürburgring. Klaus Ludwig became Vice Champion, whilst AMG won the Team Championship. 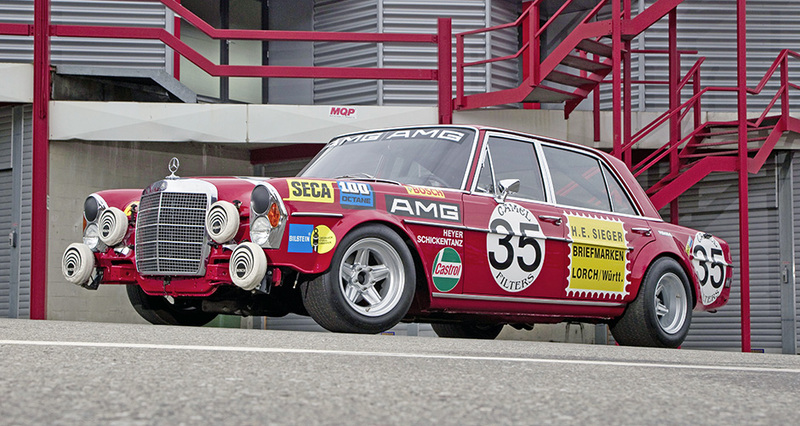 Unlikely racing warrior: The 500 SEC AMG that competed at the 1989 24 hour race in Spa-Francorchamps. Mercedes-Benz type 190 E 2.5-16 Evo II (W 201 series) of 1990. With these cars AMG started into the Deutsche (DTM). >Was this article interesting? Subscribe to our e-newsletter. ← Who is Susie Wolff?